Technology: Vacuum Forming and Thermoforming Services are plastic forming services that use heat and vacuum (or pressure) to produce shapes in thin thermoformable sheets and films. It is the process used to make a variety of plastic packages from blisters to clamshells but also has applications in forming large items from relatively thick plastic sheets. In general, thermoforming involves a single or multi cavity mold, an ability to draw vacuum on the mold, and a means of heating thermoformable material to its softening point. Variations include drape forming, plug assist forming, pressure forming, twin sheet forming, etc. A typical thermoforming service might produce a tray to hold an electronic device and its accessories in a box. While a variety of stock thermoform shapes might work, in all likelihood, special forms would be needed because of the shape of the electronic device and the need to hold it securely in the tray. 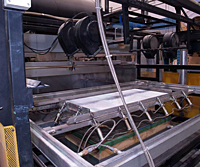 A thermoforming service could design the necessary die for the tray and produce them in quantities on thermoforming machines. Vacuum and thermoforming are alternatives to injection and blow molding. Applications Vacuum and thermoforming services apply to a range of disposable and permanent plastic products.